Crain’s No. 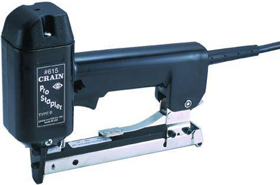 615 Pro Stapler is a proven winner for its power, durability, and economical pricing. It uses standard Crain No. 619D, Duo Fast No. 5418 or No. 5415 electric tacker staples (or generics). Features a powerful 11 amp. solenoid that drives into hardwoods, a jam-resistant magazine that holds 100 staples, and an easy-access driver channel for quick removal of broken staples. 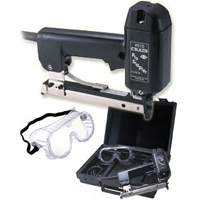 The Pro Stapler has also been designed to make your work easier. Low overall height fits under stair risers. Its pointed tip easily parts carpet yarns. High impact plastic shell makes it highly durable and long lasting in use. Also equipped with a trigger-lock for safety. Powerful 11 amp solenoid Low height fits under stairs Easy access staple channel Durable high-impact shell.